Woolly Mammoths became extinct around 4,000 years ago. However, scientists say they are on the verge of bringing the extinct species back to life. These ancestral beasts roamed across Europe, Asia, Africa and North America during the last Ice Age thousands of years ago before humans hunted the into extinction, in combination with climate change. Now, through genetic engineering, scientists say they are on the brink of resurrecting the long-extinct beasts. 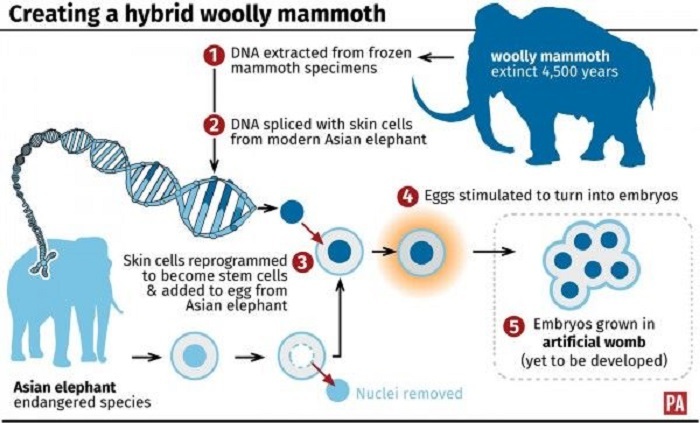 According to reports, a team of Harvard scientists is only TWO YEARS away from successfully creating a hybrid embryo, in which mammoth traits would be programmed into an Asian elephant since it is the closest living relative of the ancestral beasts. Scientists would extract DNA from frozen mammoth carcasses retrieved from permafrost, and program their genes into an Asian elephant. Scientists plant to grow the resurrected animal within an artificial womb rather than recruit a female elephant as a surrogate mother. “We hope to do the entire procedure ex-vivo (outside a living body). It would be unreasonable to put female reproduction at risk in an endangered species. We’re testing the growth of mice ex-vivo. There are experiments in the literature from the 1980s but there hasn’t been much interest for a while. Today we’ve got a whole new set of technology and we’re taking a fresh look at it,” said Professor George Church, who leads the Harvard team. The result would create an animal that has shaggy long hair, thick layers of fat, and blood that is perfectly suited to flowing in subzero conditions. “We’re working on ways to evaluate the impact of all these edits and are basically trying to establish embryogenesis in the lab. The list of edits affects things that contribute to the success of elephants in cold environments. We already know about ones to do with small ears, sub-cutaneous fat, hair, and blood, but there are others that seem to be positively selected,” said Prof George Church. “Our aim is to produce a hybrid elephant-mammoth embryo. Actually, it would be more like an elephant with a number of mammoth traits. We’re not there yet, but it could happen in a couple of years,” added Prof Church. Until now, the team have stopped at the cell stage, but are now moving towards creating embryos.